Being a Charlton fan in China has its obvious inconveniences. But there're also some big advantages that supporting other clubs doesn't have. Thanks to Charlton Life, this amazing online community, I've had the privilege of making friends with some of the greatest people in this world (no exaggeration). You may still remember the story I posted on here last February about me realising a lifetime dream with the immense help from Fanny and a few other kind Lifers. Little did I know at that time that there would be another amazing experience for me in merely nine months. This time another Lifer, GlassHalfFull (Alan), followed in Fanny's steps and managed to prepare a 13kg (!!!) box of CAFC programmes, England team magazines and various other souvenirs, and send it all the way from England to China. To me this is a box of absolute treasures. Back in our PL days, I watched quite a few of our games but only managed to have a couple of them recorded. Besides I didn't have broadband access at home until 2004. So over 50 magazines will surely help me remember those glory days and provide a huge lot of information on the club I didn't know. It is like a sea of CAFC history and knowledge. With these gifts I'm sure the coming winter is going to be once again a season filled with Charlton-themed enjoyment for me. The time, efforts and money Alan has put into this whole project are simply unimaginable. So I'd like to use this thread to share my joy with other Lifers and thank the gentleman for his incredible kindness and generosity. Of course Alan deserves so much more than just a thank-you thread. Like I've said before, one day I'll travel to The Valley and meet Fanny, Alan and all those who have helped me. To thank you all in person will be the first thing to do when I eventually make it to London. Well done to all who helped. I'd quite happily donate to that. It's made me feel so emotional i promise not to be rude to a spanner for at least half an hour. Jessie, read the programmes in reverse order to ensure a happier ending. I do that with my wedding dvd. Great stuff. Well done GHF. Great post and well done to GHF and all the others who make this such a special community and club. 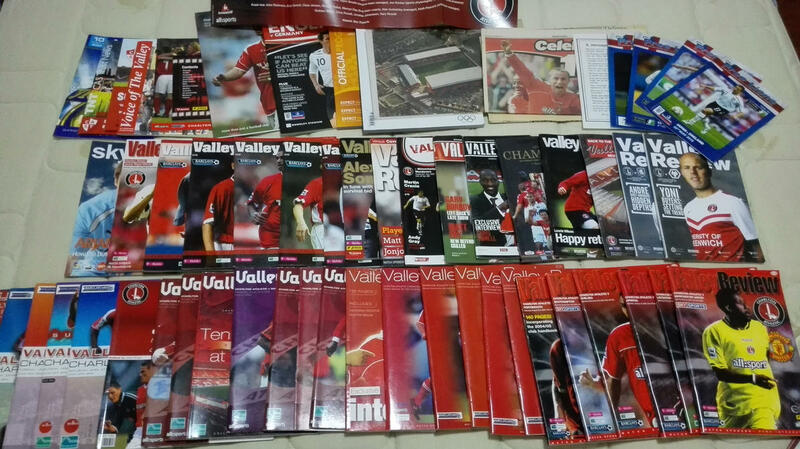 Well, now .... what got me started was @kevaddicks posting on here that he had 91 Prem programmes for disposal for charity. The response was predictably underwhelming - from previous such offers I knew this is no sellers' market. It seemed to me that the programmes deserved proper respect - what better solution than to send them to a worthy Charlton-starved outpost where they would be received with great honour. I made sure the charity got a few bob, too. So, where to send them? Jessie immediately came to mind. After she had introduced herself to us a year ago, a number of our great fellow fans got together to send her some real treasures - no more worthy recipient whose far-away loyalty to the cause has kept on shining even during our darker days. I thought that Jessie would absolutely treasure the programmes, together with some other items, so I got in touch. I engaged Fanny to ride shotgun on the project, and I have to say that her unflagging encouragement (and also a financial contribution from her and her circle) was invaluable and very much appreciated. The motivation for this modest venture was partly to reward a devoted and distant comrade for such unstinting and inspirational support, and partly because these pages are full of so many worthy deeds (last Saturday's events to name one, and FF and Mr FF's wonderful achievement with the Memorial Garden as another, and there are many, many more humbling examples). I'm so proud to be an Addick. I've still got 50-odd programmes and a few more bits and bobs to send, so where to next, do you reckon? put me down for a tenner. Might be ambitious, but I think we could make it happen. Not sure if Jessie has seen the team play but it probably wouldn't take too much if lots of people chipped in. I just hope that seeing them play in the flesh wouldn't put her off! Joking aside, this thread shows what a great club this is. I don't think this would happen at Man U or Arsenal and I'd be very happy to chip in. Many thanks to all for the kind comments and interest. I fully agree it would be great if Jessie could be brought over - anyone got a good airline contact? Fantastic thread. Lovely gesture @GlassHalfFull! GHF is a star for sure & due to my very minor part in this venture, it has been my pleasure to make his acquaintance. I don't believe I'm speaking out of turn but I'd like to add that Jessie's benefactor has not been having the best of days of late. However, this has not stopped him making The Parcel his priority. It seems that once a cunning plan has been hatched, he's your man ! does Jessie need a visa to come over ? More kind words - thanks so much. Fanny - that will take some living up to, but it would be great if we can keep things on the move. I'm sure if we really put our minds to it .... We are MANY, we are ONE. Well done GHF, Fanny et al. I'd chip in a bit to help Jessie get to The Valley too. Jessie, I think we need to clarify something. We know that your appreciative comments are heartfelt and totally genuine but in no way should you feel indebted - if anything it should be the other way round because your wonderful story really connected with so many folks here. In the dark moments and uncertainty of last season you were an inspiration and an example to us all. Well done #Fanny & #GlassHalfFull. The people on this site are terrific. Many thanks again for all the nice comments. It would be remiss of me not to give further credits, as follows: my son's girlfriend Caroline, who was a tremendous help with the packaging (everything arrived in perfect condition); the really helpful ladies at the courier firm Transglobal Express (recommended on here), and UPS - super service.